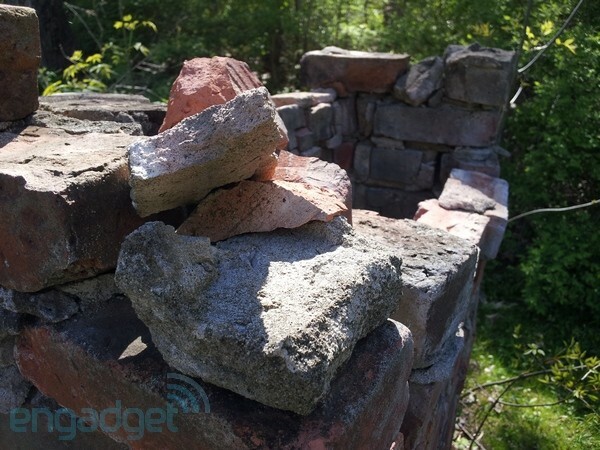 We're just getting into the swing of spring, flowers blooming and skeeters biting, but already it's been a great year for Samsung -- if we ignore the whole lawsuit thing. 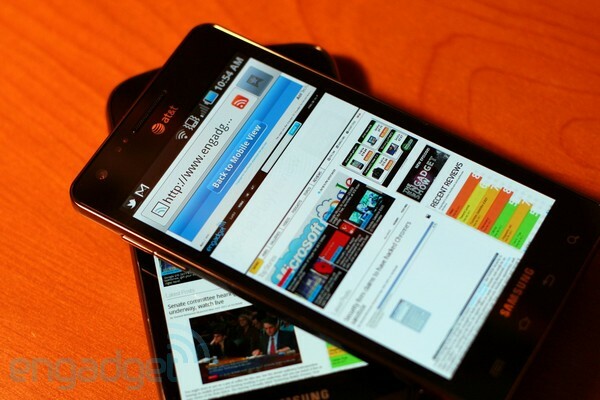 Just a few weeks ago the company delivered to us our highest scoring Android phone yet, the Galaxy S II and, while that handset has not appeared on American shores, we were graced with the Droid Charge, which offers LTE speed, strong battery life, and an on-contract price that slightly exceeds its design. Not so with the company's latest assault on American carriers. It's the Infuse 4G, it's $199 on-contract, and it has a decidedly high-end feel. 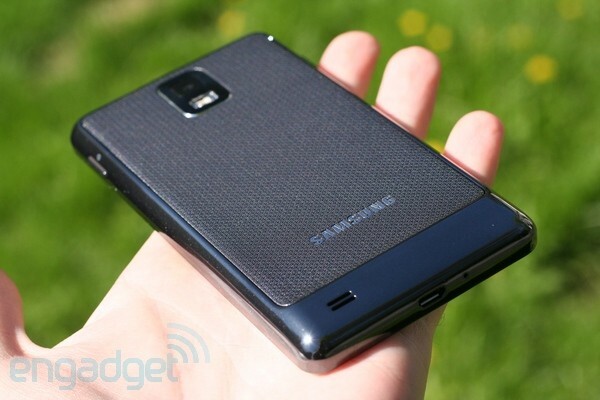 It even looks a little like the S II -- if you squint. This is its own phone, though, a giant 4.5-inch screen setting it apart from its predecessors, and a giant battery inside giving it plenty of life. But is it really as good as it looks? We were about to pack up the Charge and ship it away when the Infuse 4G arrived in its little orange and white box. While these are very similar phones in a lot of ways they certainly don't feel at all related. The Charge has that pointy chin, cheeky physical buttons, and a little extra junk in the trunk that makes its thoroughly plastic construction feel a wee bit flimsy. The Infuse 4G definitely has a lot of the same DNA coursing through its chassis but in an exterior that's far more chiseled and free of excess anything. It's definitely been hitting the gym. It's just 8.9mm (.35-inches) thin for the most part, swelling to 9.24mm (.36-inches) down at the bottom. This thinness helps to hide the phone's overall size, which is considerable. Its gorgeous 4.5-inch Super AMOLED Plus display hasn't been saddled with much of a bezel, but a screen that large is only going to appear on a hunky phone, and that this is. Measuring 132mm tall and 71mm across (5.2 x 2.8-inches) it's a big, wide slice of Android 2.2, but at least at 131g (.29 pounds) it won't weigh your pants or purse down too heavily. The phone is your typical, simple rectangle; bulge at the bottom the only bit of shapeliness not left behind on the stair-stepper. Otherwise the back is completely flat, livened up by some texturing that makes it a pleasure to hold. Yeah, it's just plastic, but it almost feels classy. Almost. Stick a fingernail under it and that class peels away, containing a beefy 1,750mAh battery and a slot for a SIM card. Beneath the battery is a microSD card, a measly 2GB that certainly puts off any pretenses of this being a properly high-end device. But, that's not all the storage this has to offer. Internally the phone has a 2GB hunk for apps, a separate 13GB slice for... whatever, and then the microSD card as well, which gives you a grand total of right about 16GB in three partitions. Mount the phone to your computer and you'll see two shares, the larger internal bit of flash and your microSD card, meaning if you have a lot of tunes you'll likely have to split them manually. That's not the end of the world, and Google's Music app certainly doesn't care which share the files come from, but it's certainly not as clear as simply having a giant hunk of storage. Of course, there's nothing stopping you from throwing a 32GB card under the battery and using the internal flash memory just for your collection of Mystery Science Theater 3000 Gamera movies. Or, you know, whatever. The speakerphone speaker is situated on the back, which is loud and clear, matching the overall call quality that we found to be quite good. Also on the back is the eight megapixel sensor paired with an LED flash, the same unit we've been getting quite familiar with lately in both the Charge and the Galaxy S II. Here it records video at a maximum of 720p and, like on the Charge, will auto-focus while recording. You can output that video over HDMI to your HDTV, but you'll need to rely on a dongle and the phone has to be plugged in to the wall while doing it. That's a bit of a bummer. 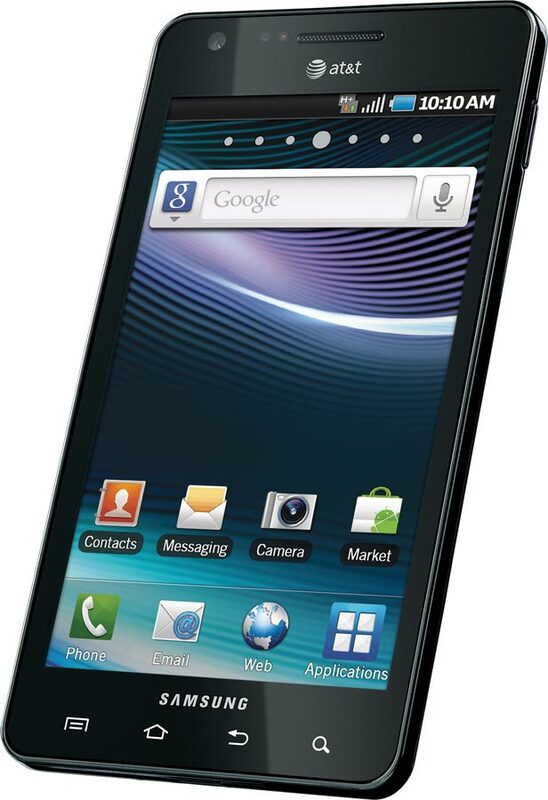 Another smartphone from Samsung, another gorgeous Super AMOLED Plus display. This one steps things up a couple tenths of an inch to 4.5, but maintains the 800 x 480 resolution of its predecessors. This means pixel density is down ever so slightly, but what stands out here is the amazing brightness and contrast of this display. It looks as good as the company's other offerings, with deep blacks, searing whites, and infinite viewing angles. Again the colors are a bit off when the brightness is lowered, and unfortunately Samsung didn't include the color tweaking tool that's found on the Galaxy S II. But, as with the Charge, we found if we kept the brightness up the colors were accurate, the whites bright, and the blacks still inky. That contrast is certainly the beauty of gooey organic LED displays, though there is another important advantage: power consumption. We were very impressed by the battery life on the Droid Charge and we have to say we've been even more enamored here. The Infuse has a slightly larger, 1,750mAh battery pack nestled inside and it easily powered us through a day of demanding use. When managed more casually (as a typical user might) it got us through most of a second. Of course, every phone will struggle to stay alive when being used as a mobile hotspot, and the Infuse is no exception. It can spew connectivity to up to five devices over WiFi, but you'd best have it plugged in to something if you want to do it for more than a few hours at a time. 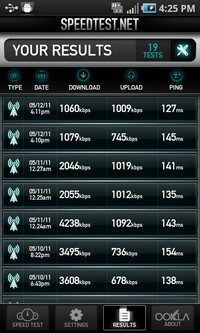 The Infuse 4G is of course AT&T's first 21Mbps HSPA+ smartphone, its fastest yet, and when all the stars aligned perfectly we did see some impressive speeds. With full bars in San Francisco we managed an impressive 8.5Mbps down, but that was definitely a rarity. 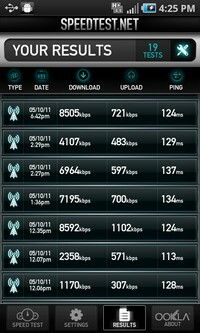 Most tests were in the 2 - 3Mbps range, with uploads at or below 1Mbps. 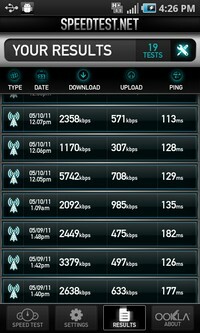 In New York City we saw similar uploads but never broke the 3Mbps barrier going the other way. Note, though, that these speeds were all over the place, seemingly fluctuating with some unidentified meteorological index and never offering the kind of consistently quick speeds we've seen on LTE. And, while the device did generally clock faster speeds than the Atrix when both were showing maximum signal, in general the Infuse seemed to be struggling a bit for bars comparatively, on average sitting about a notch lower. GPS locks were reasonably solid, taking a few minutes to figure out what state it was in but, after that, lining up the satellites quickly. In terms of speed on the device, again we're talking a single-core phone, but at 1.2GHz it's a bit faster than the Droid Charge. We didn't really notice that in average browsing behavior, but the benchmarks don't lie. Quadrant scored 1,103, Linpack ran in 5.03 seconds and scored 16.657Mflops, while the Sunspider benchmark completed in 5,054ms. That's all on the order of 10 - 20 percent faster than the Charge, which goes to show that sometimes CPU cycles do count. We're pretty sure the eight megapixel sensor slapped on the back here is the same one we've already seen in the Charge and the Galaxy S II so we won't blather on too much here, except to say that it's still very, very good. Pictures look sharp, colors look bright, and the 720p footage here is quite good -- if occasionally a bit soft. The Infuse 4G is another solid offering from Samsung that we think those of you with wide pockets and big hands are going to fall in love with. It doesn't quite reach the blistering processor speeds of the Atrix, doesn't have a fancy composite back, and is completely bereft of laptop pretenses. It does, however, have a stunning screen that's big and the kind of battery life that could finally put your charge anxiety to rest. Maybe, just maybe, you could leave that second battery at home.